Plexus Ease comes in both a capsule and cream form. Click here for Plexus Ease Cream. Recommended Servings Per Day Take 1 to 3 capsules as needed. Best time to take As needed. Yes, Ease is safe. Plexus meets or exceeds all regulatory standards and guidelines for product safety and efficacy. If Plexus Ease is safe, why does it have a California Prop 65 warning? California’s Prop 65 (The Safe Drinking Water and Toxic Enforcement Act of 1986) requires that a warning statement be placed on products that contain levels of ingredients that may potentially have a negative health impact. Natural sources of water, such as rain or ocean, contain dissolved minerals and metals that may require the California warning. 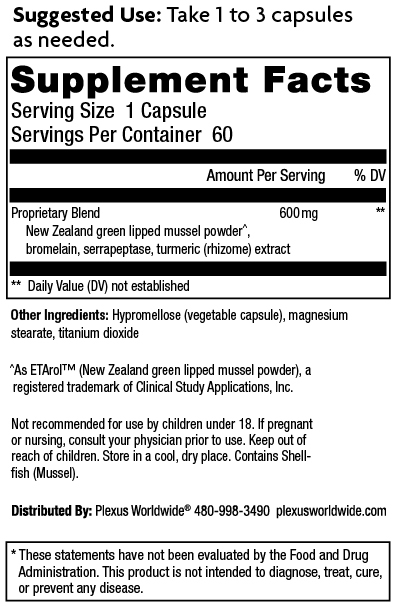 Plexus products may contain some ingredients (such as New Zealand Green Lipped Mussel in Ease) which are grown with natural water, so we pay very close attention to California’s standards in this regard. The lot number is a 6 digit number found on the bottom of the Ease Capsules bottle along with the expiration date of the product.